It is time to have a closer look at the BUK video provided by Ukrainian Interior Minister, Arsen Avakov which he released on 18th July, the day after the downing of MH17 in order to implicate Russia and pro-Russian rebels. The importance of this particular piece of evidence can not be overestimated. 1. It has been claimed this video was taken in Krasnodon, on the border with Russia. 2. Arsen Avakov claimed in a Facebook post that the video was taken by a special police surveillance team. 2. News outlets such as the Daily Mail and Paris Match still claim it was taken in Krasnodon, quoting official Ukrainian sources. 3. The Russians reacted to its release by claiming, during an official news conference, that the video was taken in an area held by Ukrainian forces. 4. The Russian claim was, predictably, followed by a wave of activity by internet sleuths out there. 5. 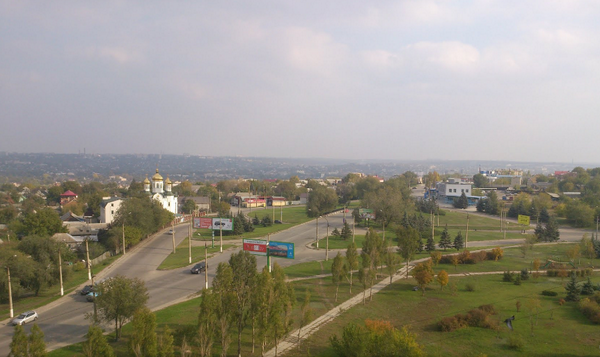 The video was geo-located to an intersection in Lugansk, 50km from Krasnodon. The Russians were denounced as liars, but generally little was said about Ukraine’s original claim. 6. Arsen Avakov, the Ukrainian interior minister confirmed the correct location but the media have continued to locate the video in Krasnodon, or said nothing about the matter. 7. I will speculate here that the Russians aren’t stupid, that they didn’t know where this video was shot, that they wanted to know and they do now. ” The video appears to show the BUK launcher with one of the four missiles it carries missing. The film was allegedly shot by a police surveillance squad at dawn on Friday as the truck headed to the city of Krasnodon in the direction of the Russian border. The footage, released on the Facebook page of the Ukrainian interior minister, cannot be independently verified. Interior minister Arsen Avakov wrote on his page: “Criminals try to hide the traces of this heinous crime (but do) not succeed. 11. The video has clearly been taken from inside a block of flats which provides a fairly long-distance view of the road. 12. It is clear that the person taking the film must have been aware that the vehicle (or at least a vehicle of interest) was coming down the road. 13. According to Arsen Avakov’s statement this footage was taken by the police surveillance team at 4.50am on July 18th. This would be nearly 12 hours after MH17 was downed. 14. If the truck with BUK was travelling up from Snizhne (where the plane was allegedly shot down) the normal route would appear to be via the M04. The route it has gone down would appear to be a diversion, or an alternative route (or perhaps it was going somewhere else than Russia). 15. The turn-off from the obvious route (sticking to the M04) is only just over 1 km from the filming location in the flat. 16. It therefore is extremely unlikely the surveillance team who took the video was following the truck. It is more likely they knew it was coming, which again means it is most likely they knew exactly what route it was taking. 17. They could have known what route it was taking and that it was coming, because of electronic intercepts, in which the driver said which way he was going to go (though why he would provide this detailed information to someone on the phone is a good question) or because the driver had told the police which way he was going, or they had told him which way to go. 18) If through electronic intercepts, why would the surveillance team choose a place to film from where it is impossible to see all the details of the trailer and BUK clearly – ie just well enough to make out that there seems to be a missile missing. 19) If Ukrainian covert operations people knew where this BUK and trailer was travelling, why has far more footage not been released, for instance showing it going to the Russian border? 20) Why has no footage of this BUK, with its cover removed showing the missing missile and no dashboard cam recordings turned up showing it between Snizhne and Lugansk or between Lugansk and the Russian border? 21) If a police surveillance team was based in this flat, wouldn’t they use a high quality camera on a tripod, rather than what appears to be a not very high-resolution video camera? To sum up, the statement of Avakov, the film and its location suggest the Ukrainian authorities had advance knowledge of this BUK and trailer’s movements or control over it. It is also extremely strange that this BUK, allegedly after shooting down MH17, is supposedly filmed by a Ukrainian surveillance team (in ostensibly rebel territory? ), with its covering missing, as if to show the world a missile is missing. Comments are welcome below – (on topic please). Donations are even more welcome! Update – Article updated 07/09/2014 thanks to a very useful comment below. The place where the video was filmed is marked as pro-Kiev territory on UA maps on the 17th and 18th July. That is a very interesting find! 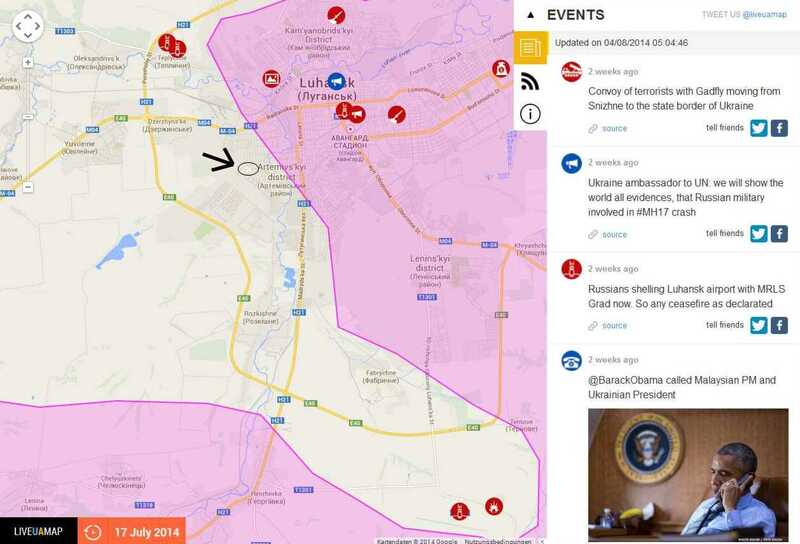 “interactive map from Kiev” To me it’s never inline with the official military map of UA. It’s updated according to social media etc. info from battlefield, sometimes it’s right sometimes it’s wrong. As all rebel maps indicate the area being under their control, more study is needed? Reblogged this on 2012-2016: de grote verdrukking. I have my doubts about the authenticity of that video, in fact all the sightings of the “stolen Volvo”. Well if anybody relies on the precision of the map with the separatist control lines by LiveUAmap, please watch what happens to the line when you go back 6 days, from 17/7/14 to 11/7/14. Please, you hobby journalists, this map is entertainment, it is based on tweed infos, this is NOT a reliable news source!!! In one Point you are right: The map was different 6 days before. And why? Not before July 14th ukrainian troops forced an attack along the E 40 towards the airport in the south of Lugansk. So they had to safeguard the E 40, because in was the only way for supply. It seems impossible to me, that a BUK-Laucher driven by rebells could have passed this street at that time. Well – the truck appears to be identical with the one paris match filmed in Donezk (which was under Separatist Control) and Torez (wich was unter separatist Control). The Truck was “borrowed” from a donetzk based comany by Separatists (owner was interviewed) that offers Excavators for rent. You can look up the Telephone number in the Donetzk yellow pages.